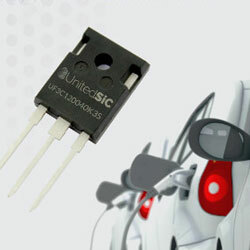 UnitedSiC has launched its UF3C FAST series of 650V and 1200V high-performance silicon carbide FETs in a standard TO-247-3L package. The series provides increased switching speeds and higher efficiency levels than existing UJC3 Series from the company. Based on the company’s proprietary cascode configuration, this new series offers higher switching speeds while at the same time provides a ‘drop-in’ replacement solution for most TO-247-3L IGBT, Si-MOSFET and SiC-MOSFET parts. This infers system upgrades for greater performance and efficiency can be affected without needing changes to the prevailing gate drive circuitry. Turn-on losses can be reduced based on a 50% reduction in Qrr. For high current use, low-cost RC snubber is needed, which also simplifies EMI design. Applications ideal for use with the series includes the full range of hard switched circuits such as active rectifiers and totem-pole PFC stages, commonly used in EV charging, telecom rectifiers and server supplies.